Welcome to Arizona Skies Meteorites® Mokume Gane Ring page. 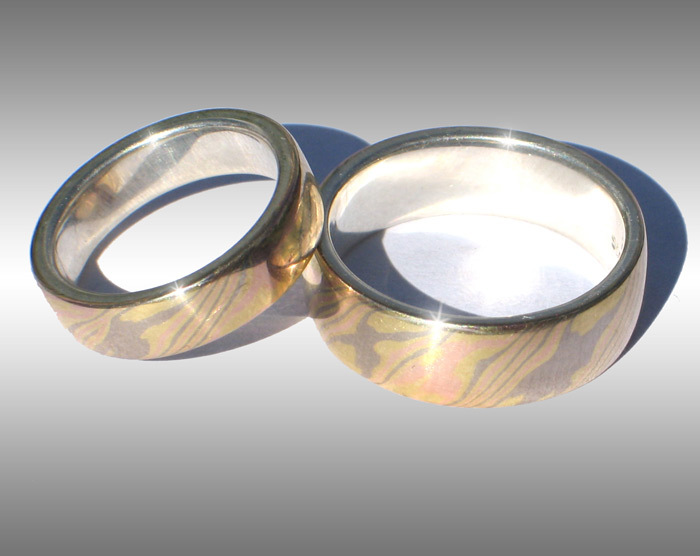 We offer fine quality, Custom made Mokume Gane rings at reasonable prices. Mokume-gane is a time consuming process of forging different precious metals into a laminate displaying beautiful layered patterns. The term Mokume gane is Japanese for "wood-grain metal", and is derived from the beautiful patterns created during the forging of ancient Samurai swords and edged weapons. Below are examples of our available Custom Mokume Gane ring styles. These rings are also available with 14k rose gold, 14k yellow gold and 14k palladium white gold liners (please ask for specific pricing). Due to their Custom nature, there are no returns on custom Mokume ring orders. Style #1: Elegant Mokume Gane Rings. 18k yellow gold, 14k rose gold and 14k palladium white gold Mokume with a Sterling Silver lining. Shown in a size 5 x 5mm width and size 9 x 7mm width. Please inquire for pricing. Style #2: Elegant Mokume Gane Ring. 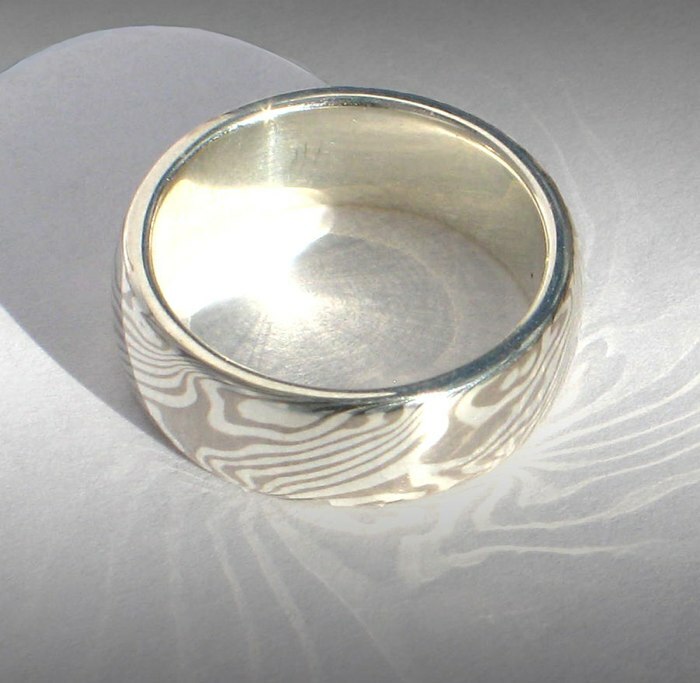 14k palladium white gold and Sterling silver Mokume with a Sterling Silver lining. Shown in a size 7, with a 7mm width. Please inquire for pricing on other sizes or widths. 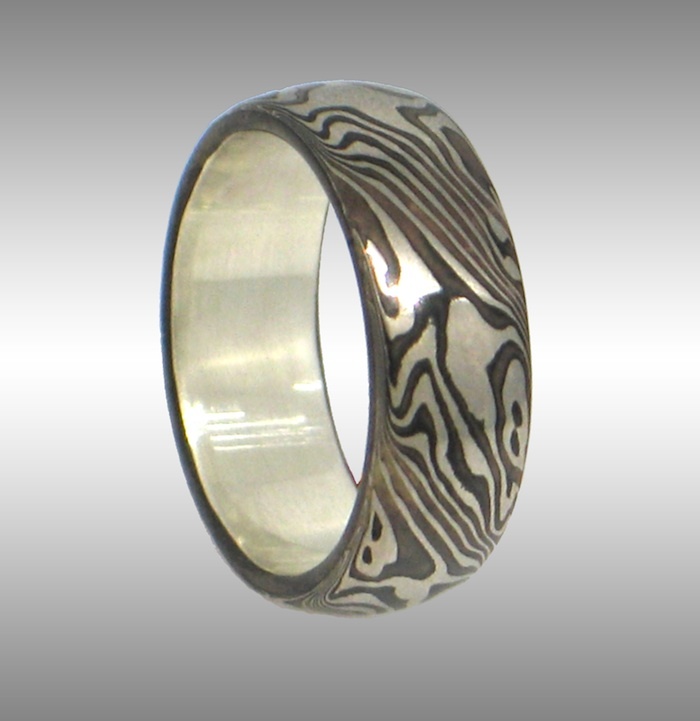 Style #3: Elegant Mokume Gane Ring with Contrasting Pattern. 14k palladium white gold and Sterling silver Mokume with a Sterling Silver lining. Shown in a size 7, with a 7mm width. Please inquire for pricing.